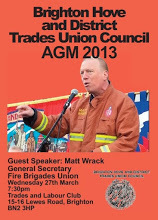 All trades union members are invited to come along to hear Matt Wrack, General Secretary of the Fire Brigades Union, speak – as firefighters face massive hikes in pension contributions and London FBU fights reckless cuts opposed by everyone except Tory Mayor Boris Johnson. 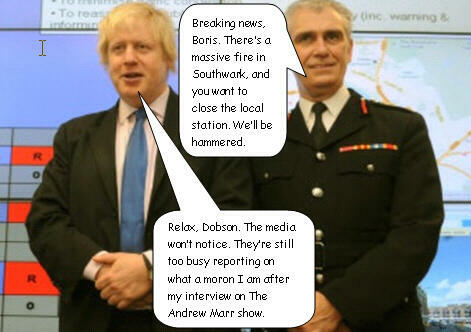 How can 4.7m Londoners be told to wait longer for a fire engine but that their safety will be unaffected? Will you still be safe visiting or working in London? Find out the latest plans for a national march through London in defence of London Fire Service: the 12 firestations threatened with closure, the 520 firefighters facing the sack and the 18 fire appliances being scrapped. Also get an update on the plans of Tory Fire Minister Brandon Lewis to privatise all Fire and Rescue Services countrywide. Have these proposals been withdrawn as Eric Pickles suggested? Come along to find out more about the FBU’s campaigns to defeat Coalition cuts and privatisation and why each major incident in London – from the Vauxhall helicopter fire to the Southwark museum fire, exposes the dangerous nonsense of Johnson’s cuts.